We will eat almost anything sweet — especially if chocolate is involved. And you know me, I’m always on the look-out for super simple recipes that can start from a boxed mix if necessary. I knew that mixing a cake mix with a can of pumpkin made really yummy (and a bit healthier) cake… but since the Dekkers definitely prefer brownies over cake, I decided to see if this super simple 2-ingredient method would work with a brownie mix too. To my delight… it does! I should mention that although I’m not a health food nut, I am smart enough to realize this recipe isn’t actually a “healthy” brownie… nope, it’s just a little “healthIER” than the regular stuff! Grease whatever pan you choose to use. In a medium bowl, mix brownie mix and pumpkin. Pour mixture into baking dish. Bake according to the instructions on the back of the box (depending on what size pan you’re using). I didn’t believe that could be true — and it’s not. You CAN definitely taste the pumpkin, but in my opinion, it’s not bad. 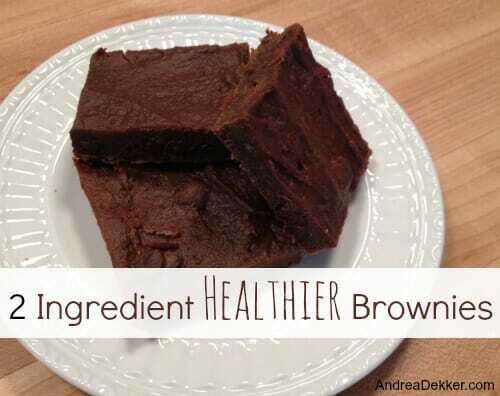 They are healthier than using oil or butter to make brownies. They don’t have egg for those with allergies. They are so ridiculously simple to make — I had them ready for the oven in about 3 minutes. They are much more “fudgy” than normal brownies — which we love. They are not crumbly — a.k.a. great for kids! They definitely taste “pumpkiny” which could be a turnoff for some people. They are thinner than normal brownies — I might try them in a smaller pan next time. They probably won’t win a “best brownie ever” award — at least not by me. They use pumpkin which can be difficult to find year round. For me (and for Dave) the pro’s of this recipe out-weighed the con’s — and the fact that they were so simple to make meant that I just had to share them with you. Plus, Nora really REALLY liked them — and you know that’s saying something! In general, I’ll probably stick with my other “healthier” baking tip of substituting applesauce for the oil and still using eggs… but I figured this recipe is a nice change of pace — and perfect for anyone allergic to eggs. So if you’re looking for a really simple, healthier brownie mix, I’d suggest giving this one a try. What are your favorite simple desserts? We had a nutritionist come to work and give us tips during a lunch and learn. She made brownies with a can of black beans. Just like with the pumpkin – you couldn’t really tell but they wouldn’t really win a contest. They definately help with a chocolate craving. I have a friend that sprinkles powdered sugar on top of the brownies to “dress them up”. You can make delicious, moist cupcakes/muffins with pumpkin too. You just combine one box of chocolate cake mix and one can of pureed pumpkin, then dump it in a cake pan or muffin tin and bake. They’re so good! I picked up the “Fat Witch Brownies” at the library last week. 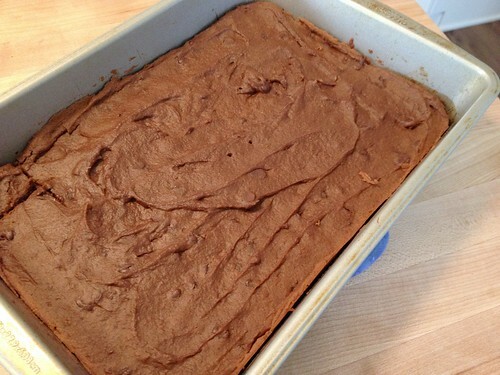 I read tried the simplest one (Cocoa Brownies) with the ingredients I had on hand. I am not a brownie person, but the family eats any sweets. These were the best I have ever had! I made another batch of ‘Blondies’ a few days later and then back to the first ones a few days later. Needless to say, now that I am OUT of cocoa, I think I will wait to actually buy more to save the teeth in the house. These have real sugar, real butter and yet were so simple! If you love brownies, grab the book from the library and try these!!! And way to use what you have on hand to make something delicious! Love it! Oh, and we LOVE blondies too! Tried this with yellow cake mix a while back. Eh, so-so but I’m willing to give this a try. Love the blog! 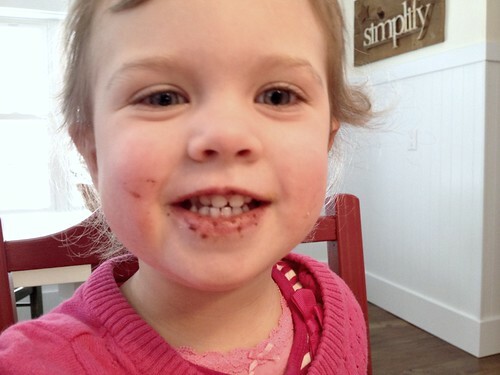 Well, they really aren’t like traditional brownies — but Nora sure loves them, and I love that they are just a tiny bit healthier than traditional brownies! Sounds yummy! I use a few tablespoons of canned pumpkin to give a little boost to a lot of things now, like pancakes, some of my spaghetti sauces, meatloaf, lots of things. I would try this recipe (and surely love it!) if I could find cake mix without trans fat. I don’t buy anything with trans fat anymore at all. 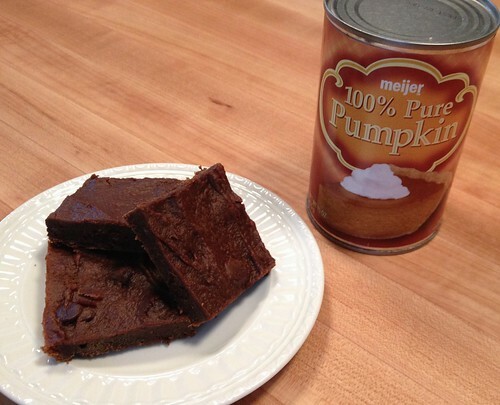 Just make your favorite brownies from scratch and use Pumpkin in place of the wet ingredients. It should work just fine! Really a brilliant thought, Andrea! And you’ve inspired me further! I’m going to make up a huge batch of my scratch brownie mix dry ingredients and keep it tightly covered on the shelf, ready to combine with pumpkin and bake at just a moment’s notice!! Oh boy, brownies more often!! Thanks! Totally trying this! One of my ‘go to’ recipes is pumpkin + yellow cake mix + chocolate chip muffins, so I think I’d love these. Thanks!